This #NYGivesDay, we ask you to support HB Studio if you believe in the power of artists. Artists, by nature, build bridges. They connect us, and reconnect us, by bringing our stories to life — opening dialogue, encouraging discourse, and expanding our points of view. They illuminate our shared humanity in uncertain times. If you believe in the power of artists to foster connection and understanding, you have a champion in HB Studio. HB was created as a workspace in New York City where theater artists can hone the skills they need to compete in a challenging field. We believe talent is a precious resource that should never be wasted and that a multitude of voices are necessary to ensure a meaningful civic conversation. We provide scholarships to ensure no artist with earnest intent but limited means will ever be turned away. If you believe artists need access and opportunity to develop their talents and unique creative voices, the HB Scholarship Fund exists to lift financial barriers so that all voices can be heard. And it is only through your help that we can continue to make that difference! On #NYGivesDay, every dollar HB Studio earns through donations will go to the HB Scholarship Fund, helping to support the growth and talent of the actors, playwrights, and directors whose creative work connects and enlightens us. As a non-profit organization, donations from our alumni, colleagues and friends help us offer over 350 scholarships each year. Help us grow this number to 400! ➢ Aspiring actors get the support they need to start strong in a highly competitive industry. ➢ Life-long learners develop their artistic skills and creative projects. ➢ Professional artists maintain and develop their craft. ➢ Make a donation of any size to the HB Scholarship Fund. ➢ Help us spread the word! You can text a friend, share this website, or post to social media to help raise awareness about HB. ➢ Be sure to use the hashtag #NYGivesDay on Facebook, Twitter and Instagram when posting to your own social media. A donation to the HB Scholarship Fund is a gift to artists who connect us and allow our society to flourish. Please give this gift of opportunity to more HB artists on Tuesday, November 27, and help this proud New York non-profit continue to support the power of artists. #NYGivesDay celebrates the transformational work of New York non-profits on nationally recognized Giving Tuesday. 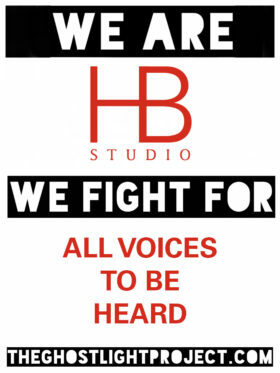 On this day, all donations to HB Studio will benefit the HB Scholarship Fund, in tribute to the students who are the heart and soul of our mission. Thank you for your generous support on November 27, 2018! 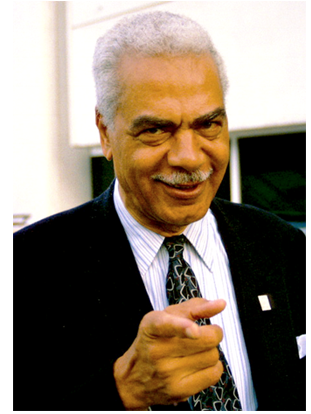 New York, NY (Dec. 18, 2017) – HB Studio, one of New York’s most venerable institutions for theater training and practice, will host a Memorial Tribute to Earle Hyman. Formerly of HB’s acting faculty, Mr. Hyman was a longtime HB friend. A brilliant actor, teacher, and mentor, Mr. Hyman’s career broke many boundaries, both in the United States and abroad. HB takes pride in honoring his legacy and invites friends, family, students, colleagues, and admirers to celebrate his life. DATE & TIME: Sunday, January 14th, 2018 at 3:00pm, reception to follow. LOCATION: HB Playwrights Theatre (124 Bank Street in Greenwich Village, NYC). For #NYGivesDay, 2017 we asked you to remember when a performance has brought you hope, delight or deeper understanding. In troubled times, we need to support the growth of the artists who become our nation’s storytellers. Help HB reach our summer FUNdraising goal! 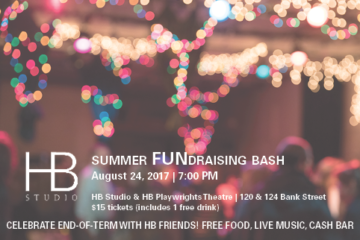 By supporting the Summer FUNdraising Bash, you directly help HB Studio continue to be one of the best artistic homes for actors, playwrights, and directors in the heart of New York City. Through the loving support of our community, we have trained hundreds and thousands of artists over 70 years. Let’s keep it going for 70 more! All proceeds directly support HB’s training & development programs, performance opportunities & productions, support for building improvements throughout the year, the Hagen Institute and the HB Scholarship Fund. HB Studio proudly joins The Ghostlight Project next Thursday, January 19th, 2017 at 5:30pm. Bringing together over 500 participating organizations in all 50 states and the District of Columbia, groups across the U.S. will be holding “be a light” events as a collective, simultaneous action to reaffirm our commitment, as theater people, to protect values of inclusion, participation, and compassion for everyone — regardless of race, class, religion, country of origin, immigration status, (dis)ability, gender identity, or sexual orientation. Inspired by the theatrical tradition of keeping a “ghost light” on in a darkened theater, we create light for the challenging times ahead. For HB Studio, this means a reaffirmation of our legacy as a “safe space” that welcomes and supports all artists in their effort to give authentic and relevant expression to their experiences, in context of our times. In our search to connect with our own voices as artists, we affirm the importance of supporting all voices to be heard. Bring a bright white light to shine (your phone’s flashlight is perfect! ), weather appropriate clothing, and an open heart. We will unite in our common goal of inclusivity … followed by a casual Open Mic in the theater, where we can share our voices with one another! In the dark times, tell me, Will there still be singing? Yes, there will be singing: About the dark times. We are here tonight as representatives of HB Studio. I’d like to share with you some ideas about the commitment HB represents and must uphold, and the commitment we make going forward. We are here because we understand the danger of reaction. We are concerned that something has been unleashed among us. Our founder, Herbert Berghof, was a refugee, and we know he understood firsthand what it means when those who feel their opportunities are shrinking are given license to hate. 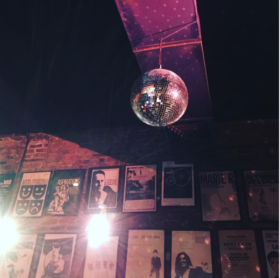 HB was founded as a safe space for creative souls. It was a sanctuary for artists of all backgrounds; it provided shelter from McCarthy’s blacklist; it offered opportunity to those who lacked the means or circumstances to make a start in the theater. Its hallmark was, and is, creative freedom. HB as a safe space for artists is only meaningful if as artists we translate that privilege into sustaining safe, illuminated, brave spaces in our world for all. A mission is only as vital as our commitment to realize it in action. We must continue to examine its relevance and its relationship to our changing circumstances. As artists we are sensitive, but we can’t afford to be fragile. We are intuitive, but we can’t afford to wait to be told what to do. We must make a commitment to be actors, to translate our feelings into beautiful, meaningful actions. We have beautiful tools to use to translate our experience into expressive form. Whose experience are we expressing, and what meaning does it have for someone else? What gives it meaning for someone else? What listening do we have to do, what seeing, to answer that question? We have been fortunate to work this past December with Russell G. Jones through his Blind Spot project. We make a deep commitment to continue to examine our own awareness, to acknowledge and to face our blind spots. At HB we know we have a diverse community but we also know that we do have our limited frameworks, our comfort zones, and that we are not a particularly diverse institution. We acknowledge this because acknowledgement is a place to start. And we refuse to protect our interests by turning a blind eye to someone else’s need, a deaf ear to other voices. HB is a place that was founded by refugees, and part of its conception is that it should be a sanctuary where creative freedom is a primary value. We affirm our commitment to support and protect those who are excluded or suspected, who are refugees, who are still seeking a home in this world. That means we honor all voices – that in seeking to recognize the power of our own voices we necessarily are enlisted to protect and support other voices as well, and to be willing to take risks in protecting and supporting others. Not by being a savior or by “owning” other voices, but by stepping aside to let them be heard. Handing them the mic. Martin Luther King, in his Strength to Love, writes about the story of the good Samaritan. Most people, he says, when they see a man in trouble, will say, what will happen to me if I stop to help him? (Will I lose my standing? Will I too be beaten?) King says, we must ask, what will happen to this man if I do not stop to help him? And I think we must also ask what happens to our world when we become people who do not stop to help. We all know that connections and relationships help people succeed. We commit to being a connection, and not just for those who reinforce our own certainties. This is real doing, not “acting like doing,” that we are seeking here, and real action takes searching and deep work on ourselves. As artists, we know how to do this work. For those who are interested, we will be organizing a series of monthly lunchtime roundtable discussions in our new faculty greenroom on the second floor of 122 Bank Street. Together we’ll be looking at questions like what it means for HB to be a safe space; the legacy and possibilities of that; and what it means for a safe space to also be a brave space. We’ll be looking at implicit bias, and observing where it may live in our institutional structures and ways of working or doing business. We will be gently but actively probing these questions and seeking further actions we can commit to together. We invite you to join us. Whether you are able to sit at our table with us, or send us your thoughts and input virtually, we’d love to have you along. One of our immediate, small actions, one small step forward in our thinking, is to create a new scene list for HB Studio that gives representation to the experience of all members of our community, and also to those who may not yet feel welcome here. If you’d like to take part in that project, please get in touch with Catrin Lloyd-Bollard or with me.